"The new model of feminine leadership is not about hierarchies of power but about circles of collaboration. For us to become true leaders, we must embrace our sisters as our allies and give one another permission to shine." ​The 12 Week Sistership Circle Experience is about finally letting go of worrying about what others think of you and speaking authentically and vulnerably about what you are going through in your life so you can let go of what’s not serving you and step into your power as a new generation feminine leader. ​WHY AM I OFFERING THIS PROGRAM? It's simple really...Sistership Circle is hands down the most powerful personal development I have ever done....and I've done a few!! In all seriousness, Sistership Circle transformed my life and gave me the confidence to go out and fulfil my dreams plus allowing me to feel deeply supported and connected in a sisterhood. So it is my absolute duty and calling to offer this to as many women as I can. 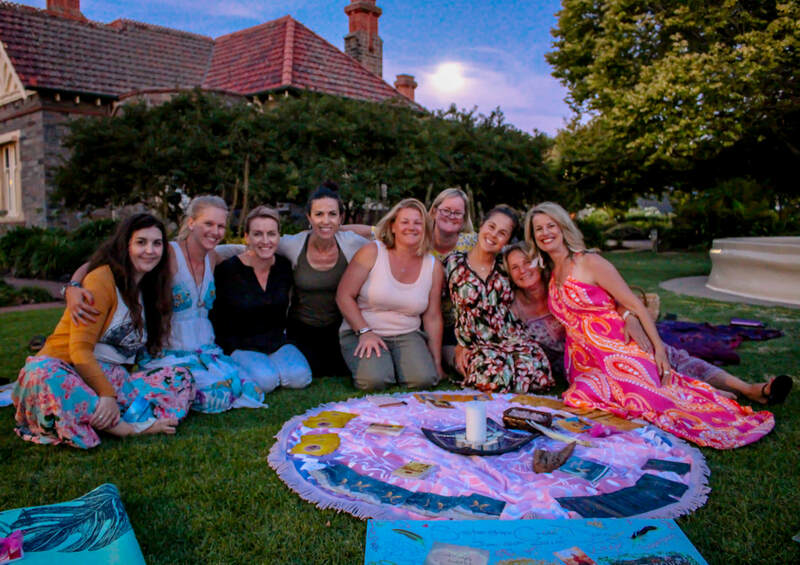 As a Certified Sistership Circle Master Facilitator and Trainer, having led over 100 circles and successfully delivering this 12 week program to many women, I feel honoured and humbled to be contributing to the call of the divine feminine for women to rise up into their brilliance. ​"PETA'S ABILITY TO CREATE A SAFE, ENCOURAGING AND SACRED SPACE, ALLOWED US TO DIG IN DEEP, CONNECT WITH OURSELVES AND FEEL LIKE WE CAN TRULY OPEN UP. PETA HOLDS SPACE FOR ALL WOMEN EQUALLY, WITH A GENTLE POWER THAT SOMEHOW RELEASES BURDENS AND CREATES AN UNDERSTANDING BETWEEN ALL WOMEN ALLOWING EACH SISTER TO HOLD SPACE FOR ONE ANOTHER WITH NO SOCIAL AWKWARDNESS. I FELT SAFE AND CONNECTED TO MY SPIRIT, TO DIVINE ENERGY AND TO MY GUIDES. I ENJOYED THE CONNECTION BEING REIGNITED AND DEEPENED. IT WAS A SOUL CRAVING THAT WAS FULFILLED BEYOND MY EXPECTATIONS." Visit the official Sistership Circle website to learn in detail all the juicy benefits you will receive and an outline of the course curriculum. ​All bookings and payments will be taken via this website petabastian.com so please return here to reserve your seat. ​GOT QUESTIONS OR NEED TO CHAT FURTHER TO SEE IF THIS IS RIGHT FOR YOU? "MY CIRCLE EXPERIENCE . . . . . THIS WINTER HAS BEEN A HUGE AND TRANSFORMING EXPERIENCE FOR ME. I ENTERED INTO THE CIRCLE WITH A FEW INTENTIONS. - TO DO SOMETHING FOR MYSELF AND DELVE INTO SOME OF MY FEMININE TRAITS THAT HAVE BEEN READY FOR A SHAKE UP. - TO FIND SOME ‘SISTERS’ WHOM I CAN CONNECT WITH AND MAKE SOME LIFETIME FRIENDSHIPS THAT I HAVE YEARNED FOR. HAPPILY, THESE TWO NEEDS HAVE BEEN MET BEYOND MY EXPECTATIONS. THERE WERE A FEW TIMES THAT I NEED EXTRA SUPPORT AND COACHING THROUGHOUT MY JOURNEY AND PETA WAS ALWAYS AVAILABLE TO ME. WHETHER IT BE EMAIL, THE PHONE OR A PRIVATE CONSULT. THIS WAS IMPORTANT FOR ME TO REALLY FEEL LIKE I WAS ‘HELD’. PETA ALWAYS ‘HAD MY BACK’. I WOULD HIGHLY RECOMMEND THE CIRCLE TRIBE TO ANY WOMAN WHOM WAS IN NEED OF TRANSFORMING THEIR LIFE AND LOOK DEEP WITHIN THEMSELVES. PETA FACILITATED TO AN AMAZING LEVEL OF SUPPORT AND LOVE. BLESSINGS, SISTER KIRSTY X"
"WITH PETA'S GUIDANCE I WAS ABLE TO DEEPEN INTO WHY I HAD JOINED THE CIRCLE - THE REASONS I HAD FELT OF WHY I HAD JOINED WERE BUT A GLIMPSE OF WHAT WAS GOING ON IN MY HEART, MIND AND SOUL. I WAS HELD AND ENCOURAGED TO EXPLORE DEEPER INTO MY FEELINGS, MY INSTINCT AND MY SPIRIT. I WAS NOT COACHED - BUT HELD IN LOVE BY MY SISTERS, ALLOWING MY JOURNEY TO BE MY OWN, BUT SHARED IN AN EXPERIENCE OF LOVE AND VALUING ONE’S OWN ABILITY TO FIND HONESTY AND ANSWERS. THANK YOU PETA, YOU HAVE PROVIDED SO MUCH IN YOUR CONNECTION WITH THE CIRCLE. IT OFFERED UP SO MUCH TO ME, ALL WITHIN PERFECT TIMING.